Got to do a review for the Ramblers Hobo Bag ($128.00) from Tokidoki - yippee! Tokidoki, which means “sometimes” in Japanese, has a great website which sells many neat items such as bags, vinyl toys, clothing, make-up and other accessories. This hobo bag sure makes a statement with it's multi-colored, Japanese-inspired print! 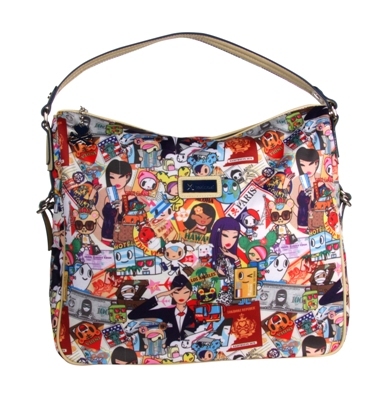 The large bag is covered with international jet-setting motifs; passports, hotels, money, types of transportation and names of many countries/states. The bag also features a small Tokidoki nameplate on the front with logo as well as the cute heart & crossbones zipper pull. This heart and crossbone logo is also stamped on the rivets that attach the handle to the bag. The inside of the bag is lined in a blue print fabric and includes an inside zipper pocket as well as two smaller cell phone sized pockets. This bag is quite large so it's good that I am into big purses that I can throw everything into! Measurements are approx 14 x 5 x 11 Inches. I can fit my laptop in here - and then some! This would make a perfect overnight bag for travellers or a cute statement bag for anyone. With the snappy print, heavy duty zipper and faux leather trim, this bag feels like it will last for many years to come! Tokidoki would love to give away one of these bags to one lucky winner from Canada or the USA. A random draw will be made by Random.org on July 2, 2012 from all entries received. Oh my! What awesome products - I really love the tokidoki Sandy Mirror Mints! I absolutely adore Tokidoki, for the last three years I've insisted that our calendar be Tokidoki. I'm a GFC friend as sablelexi. I"d love to win this! It is beautiful! I love the Soft Serve Tee! Really unique and fun items! I would love this, it is fantastic! I follow GFC as Maryann D.
Unique Artistic Hobo Bag with history/makes a statement. Great giveaway Tokidoki would honestly cherish this bag and love to own. GFC follower - Eva Urban.